Hanoi (VNA) – The 26th Annual Meeting of the Asia-Pacific Parliamentary Forum (APPF-26) will serve as a booster for cooperation in the framework of the Asia - Pacific Economic Cooperation (APEC) on the parliamentary arena, stated National Assembly Chairwoman Nguyen Thi Kim Ngan. Ngan, who is also APPF Chair for 2017 – 2018, told the media in an interview before the APPF-26 that the Vietnamese National Assembly (NA)’s hosting of the APPF-26 reflects its increasing role and prestige in regional and international parliamentary diplomatic activities. The event, slated to open on January 18 in Hanoi, is an opportunity for the NA to enhance diplomatic relations with its regional counterparts and to promote its innovative, dynamic and reliable image among international friends, she added. 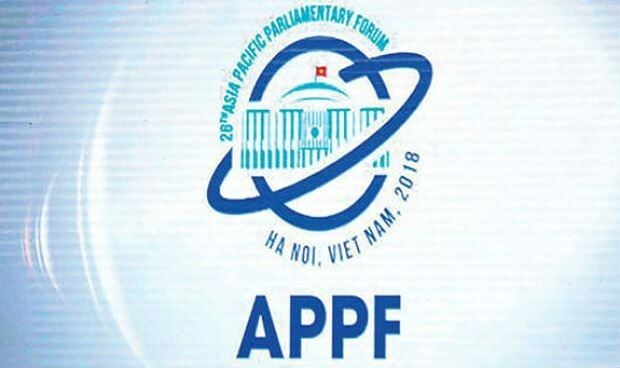 In an article on the upcoming event, Vice Chairman of the NA Office and head of the information section for APPF-26 Do Manh Hung highlighted the meeting’s mission of defining the direction for member parliaments in building an APPF vision of a common future for all and practical benefits of all nations and all people. The APPF-26 under the theme of “Parliamentary partnership for peace, innovation and sustainable development”, will focus on several key topics, one of which is how to boost parliamentary diplomacy for peace, security, and prosperity in the region and in the world. Participants will discuss pressing issues related to peace and security in Asia-Pacific, such as the Korean Peninsula, maritime security, cyber security, international terrorism, and trans-national crime. Second, the meeting will hear reports on outcomes of the 2017 APEC Economic Leaders’ Meeting and discuss economic cooperation for Asia – Pacific. Member parliaments will share their views on and contribute to regional efforts toward expansion of trade-investment engagement and sustainable development. They are set to mull over parliaments’ role in boosting inclusive and extensive economic links, food security and green farming, and the development of micro, small and medium-sized enterprises in the digital age. These sub-topics are closely related to the APEC meeting’s agenda. Third, delegates will delve into the promotion of joint actions for climate change adaptation, mobilisation of resources for sustainable growth, and culture-tourism collaboration across the region. Fourth, they will examine initiatives on improving APPF’s performance toward effectiveness and APPF’s role in regional peace and cooperation. In this regard, the meeting will examine amendments to the New APPF Rules of Procedure and to the Meeting of Women Parliamentarians. The Meeting of Women Parliamentarians is set to focus on promoting gender equality for sustainable development and shared prosperity. According to Hung, the Vietnamese NA will propose a draft of the Hanoi Declaration: A New Vision for Asia – Pacific Parliamentary Partnership, which stresses commitments by member parliaments to common goals and benefits based on mutual respect for each other’s independence, sovereignty, territorial integrity, diversity in political institutions, culture and religion; upholding of the rule of law and international law. It aims at enhancing the APPF’s role as a partner of APEC and helping the APEC to realise its commitments via parliaments’ main functions of law making, supervision and budget decisions. The APPF meeting will take place in Hanoi from January 18-21. Vietnam first hosted an APPF annual meeting in 2005. The APPF was officially formed in Tokyo, Japan, in 1993. The forum now gathers 27 members: Australia, Cambodia, Canada, China, Chile, Colombia, Costa Rica, Ecuador, Fiji, Indonesia, Japan, Laos, Malaysia, the Marshall Islands, Mexico, Micronesia, Mongolia, New Zealand, Papua New Guinea, Peru, the Philippines, the RoK, Russia, Singapore, Thailand, the US, and Vietnam.